In 2010, who would have predicted the company behind Windows and Office would be among the top 5 PC makers in the U.S.? With new models just announced, Microsoft is poised to solidify its position as a PC vendor, while Surface sales are increasingly becoming a factor in MSFT stock growth. Gartner’s report on Q3 PC shipments shows that sales of personal computers (not including Chromebooks or iPads) slipped by 0.4% in the American market. The decline was most strongly felt in mobile PCs — laptops — which continue to see Chromebooks eat into educational sales. However, Microsoft bucked the trend. Despite having a product line-up that is virtually all laptops and mobile devices (its only desktop option is the Surface Studio), MSFT’s U.S. shipments grew 1.9% compared to 2017. In all, the company shipped 602,000 units to American customers for the quarter. That means Surface sales are now not just a billion-dollar business for the company, but they’ve officially clawed their way into the top five among PC vendors for the U.S. market. Gartner says Microsoft knocked out Acer for that fifth spot. The top four are HP (NYSE:HPQ), Dell, Lenovo and Apple. To put the numbers in some perspective, fourth place Apple — which saw U.S. Mac sales drop 7.6% on the quarter — still moved over three times as many units as MSFT, at 2.02 million. Overall U.S. PC shipments were 14.8 million. Still, this was a big accomplishment for Microsoft and good news for MSFT stock as the company’s Surface investment is clearly paying off. With the company recently releasing its sixth-generation Surface Pro, it can be easy to forget the days when Microsoft had nothing to do with PC hardware. MSFT and Intel (NASDAQ:INTC) dominated the PC industry from the beginning, but did not design their own computers. Intel made the CPUs that PC vendors used in their computers, and Microsoft was all about Windows and Office, the dominant PC operating system and productivity software. With PC sales in a long decline and threatening to take MSFT stock with them, Microsoft made a bold bet. The company decided to become a PC vendor itself. The plan was to capture some of the hardware revenue, but also to provide the ultimate PC experience in the hope of keeping Windows relevant. The company launched the first Surface in October, 2012. That transition to hardware vendor wasn’t always smooth. MSFT stock was hammered in 2013 when it took a $900 million writedown on unsold Surface RT tablets. As recently as a year ago, Surface sales that failed to meet expectations had some predicting the company would abandon its PC business. However, Microsoft has stuck it out. 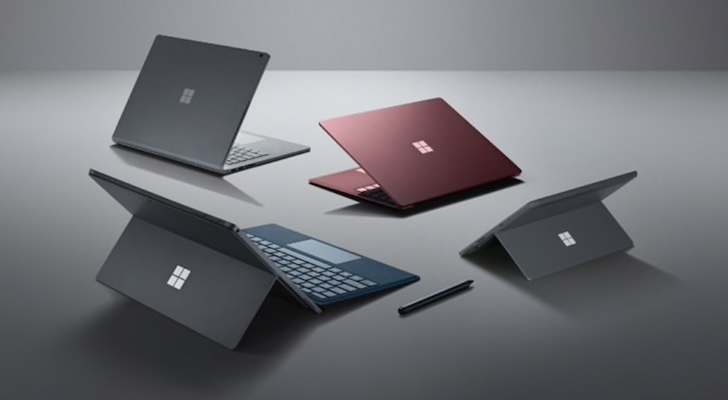 The Surface business has grown from 2-in-1 tablet devices, to actual laptops (the second generation Surface Laptop was announced a week ago). Surface sales in MSFT’s Q4 were up 25% on the year, bringing in $1.1 billion in revenue for the quarter. And that was before the Surface Go, it’s most affordable device, was launched. Surface Sales still haven’t been enough for Microsoft to place in global PC sales, but that may just be a matter of time. In the meantime, with a refreshed Surface lineup, MSFT is on track to solidify its position among the top five PC vendors in the American market. Just as importantly, its hardware showcases the best of Windows 10 and Office, helping to keep the revenue flowing in those critical divisions as well. Article printed from InvestorPlace Media, https://investorplace.com/2018/10/surface-sales-propel-microsoft-into-top-5-u-s-pc-vendors/.